A study of outcomes and extremes. Applied. Clinical epidemiology is the study of the determinants and effects of clinical decisions. Our research and our graduates bring diagnostic improvements, treatment enhancements, and a greater range of integrated responses to clinical situations. We are driven by the belief that every small step contribution to healthcare counts towards the collective. We know that local situations sometimes have global impact. We approach our field with methodological rigour. Our work forms logical links with policy in addition to care delivery. Whether in the headlines or on the front lines, we pursue research with viability and relevance – where impact and outcomes are critical to the equation. With a faculty including more than 80 leading epidemiology researchers spanning multiple departments, disciplines, and institutions, the Clinical Epidemiology program is enhanced by collaborations with University of Toronto clinical departments and affiliated teaching hospitals. Our international reputation for excellence in clinical, health database and decision sciences research shows. Unsurpassed funding support for students. More than 80 percent of students are awarded competitive peer-reviewed research fellowships to pursue training. An exceptionally high rate of successful grant applications and quality peer-reviewed publications among students. Graduates hold faculty positions in prestigious institutions in North America and beyond and most begin their research careers with prestigious peer-reviewed salary awards from major funding bodies. Others are leaders in health care research, policy, and practice throughout Canada. Clinical Epidemiology is an implementation science that focuses on health outcomes and health extremes. Our students are 100% clinically trained, and learn prediction rules so they can asses, translate, convert and activate knowledge at the point of care. Our students learn to craft interventions with better orientation towards quality of life outcomes – and they bring lessons learned back through the intellectual network that IHPME provides. Since academic research projects are geographically dispersed, students and researchers connect around similar themes and core issues, using IHPME as a hub and a graduate home base. Clinical Epidemiology and Health Care Research is offered as a concentration – previously known as a field – for Master of Science and Doctoral level students with a health professional background including physicians, nurses, physiotherapists, occupational therapists, dentists, and others. The program has produced 361 graduates since 1992. All students are practicing clinicians and many emerge as clinician scientists. Highest priority is given to students who wish to pursue a career that combines clinical care with a major research component and to those students whose training will allow them to become independent investigators. The MSc is designed for health professionals interested in learning the skills necessary to conduct clinical and health care research. This degree is offered with both a thesis and a non-thesis option. The PhD is designed for health professionals interested in an in-depth education in the tools, theories and methods of clinical and health care research. undertake clinical and health care research as an independent investigator and to compete for peer-reviewed funding. assess critically the results of clinical and health care research reported in the medical literature, to use the results of research in daily clinical practice, and to teach evidence-based practice in clinical-training programs. play a leadership role in translating the results of effectiveness and efficiency research into: clinical practice policies (practice guidelines), health policies, and reimbursement policies (e.g., the decision-making process of drugs and medical-devices approval). teach the principles of clinical and health care research to graduate students in research training programs. collaborate with other investigators on research projects and contribute to the research their unique skills – a combination of clinical knowledge of the conditions under study and research design. assist other health care providers and researchers in the design and implementation of clinical and health care research. Two streams of training are available at the Masters level – a non-thesis, course-only stream (10 half-courses including completion of a research practicum) and a thesis-based stream (6 half-courses and a thesis). serve as methodological experts in assisting others to design and conduct clinical and health services research. PhD students are required to complete 10 half-courses. 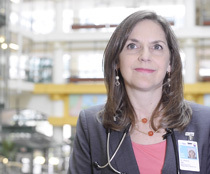 Vignette of Sharon Dell, IHPME faculty, and Respirologist and Senior Associate Scientist at the Hospital for Sick Children.